E Sgl scr,2 cyl comp,600nhp.14 kts.By David Rowan,Glasgow. H Iron .3 dks.F 56/17.07.B150/45.72.P 212 1st, 1670 £rd. 1884 Ordered by Erasmo Piaggio for Fratelli Piaggio.July : ompleted for Rocco Piaggio,father of Erasmo.Oct 27: Delivered to Genoa. Nov 11: Arrived Genoa .Dec 1: M/vSouth America.As built she had a withe hull and was brig rigget. She was the first Italian liner to have electric light. 1885 July: Acquired with the Piaggio fleet. 1886 Tripled by G.Ansaldo at Sampierdarena.Her yards were removed. 1908 Dec 29:At Messina ,to assist,following the aeartquake of Dec 28. 1910 Tranferred to Servizi Marittimi (SNNM),Palermo. 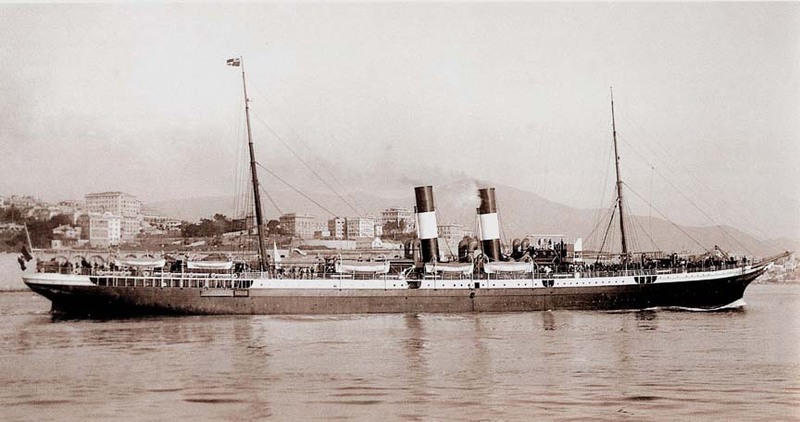 1911 Sept 29uring the war with Turkey used as a hospital ship to North Africa. The vessel was operated and paid for by the Sovrano Militaire Ordine di Malta. 1913 Feb 11uring repairs in Genoa water entered and she fell onto her side.